Can you recover/reposition to the appropriate spot (lateral and vertical) ideally by the time your ball is landing on opponent's side of the court and certainly by time your opponent makes contact with their shot? See Tiafoe do this at yesterday's Next Gen ATP Finals. 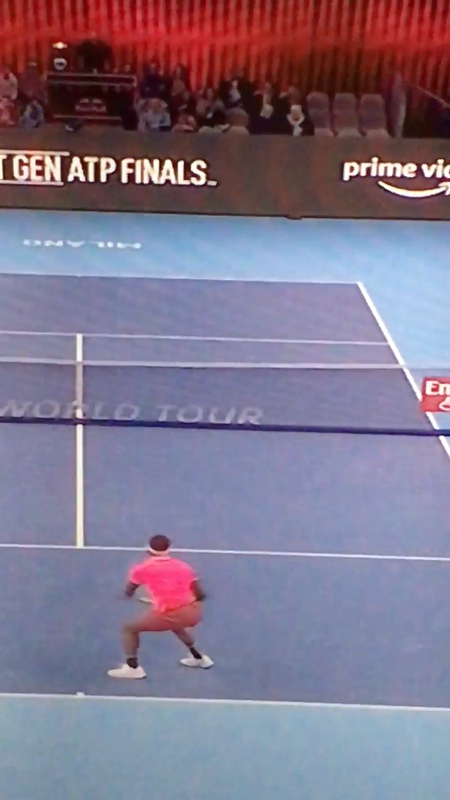 After hitting a down-line forehand (in a slight in/out direction to move his opponent) he repositions back beyond the middle of his baseline to bisect the angle of his opponent's two best possible replies, line or cross, to be ideally positioned to control the court and his space on his subsequent shot. Interesting technique also on serve and forehand - high straight arm on serve leading to level shoulders in pre-throw position with abbreviated take-back and extreme inversion of racket face on the forehand preparation. Will these be limiting factors in any way (efficiency or effectiveness) in the longer term or will his physical strength negate these possible flaws? Always a great coaching debate.